3M EGP Reflective Marking Tape 2" x 10yds. 7 year exterior performance life. These highly visible marking tapes reflect light as it hits the surface making it easily seen from a distance. 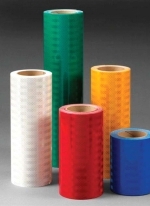 Pressure sensitive adhesive (PSA) tape can be applied to virtually any smooth, clean, dry wax free flat surface. Click here to learn more on 3M's 3430 Engineer Grade Prismatic sheeting. This item normally ships within 1 - 3 business days!